The new tough Powershot D30 compact utilises a 12.1MP CMOS sensor and a 28mm wide-angle 5x zoom lens. The high-sensitivity sensor comprises half of Canon’s HS system for optimum performance, the other half of which is the DIGIC image processor. The Powershot D30 is the world’s deepest underwater camera, able to survive and produce images at depths of up to 25 metres. 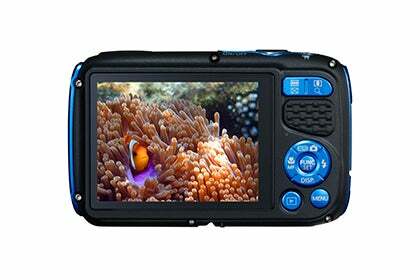 Its imaging capabilities have been optimised specifically for underwater shooting; it features a dedicated underwater mode, and the Custom White Balance function can be quickly adjusted for natural colours when submerged. The D30 is also shockproof at up to 2m, freeze proof to -10 °C and dustproof. It features a dedicated Movie Record button for immediate video capture, and its Image Stabilisation functionality also extends to video. Canon’s Smart Auto technology on the D30 is designed to detect individual scenes (a minimum of 32) and then adjusts the camera’s settings accordingly. For those who like to take more direct control, the D30 offers complete Manual functionality, and borrows the Lens Control Ring from the S series to allow users to adjust ISO on the fly. The D30 is equipped with a 3inch, 460,000-dot LCD screen with a Sunlight LCD mode that resists glare from bright sunshine. It also boasts a dedicated GPS unit, which allows users to tag individual images and movies with the precise location where they were captured, and a GPS logger can trace the path taken between captures. The PowerShot D30 will be available from April 2014, priced at £299.